Skylight windows can brighten and energize the darkest rooms in your home. They are often used in kitchens, bathrooms, or even in bedrooms as a romantic way to look at the stars from the comfort of your bed. Much more than just a luxury item, skylight windows are customizable, beautiful, and practical additions. Usually positioned on the ceiling, this type of window will not take up any wall space. Additionally, skylight windows can be especially useful in northern regions of the country that have limited sunlight. This article will provide the information you need to decide whether skylight windows are right for your home. Skylight windows are also usually made with tempered or laminated glass that can withstand impact to protect your windows from falling debris. There are four basic types of skylights: fixed, manual vented, electric vented, and tubular. Fixed skylights are typically leakproof, featuring a pane of glass that cannot be opened. Vented skylights open outward, similar to casement or awning windows, to allow fresh airflow into your home. Manuel vented open with a crank or with an outward push. Electric vented use an electric motor to open and close. A few models of these electric vented skylight windows will automatically close at the first sign of rain. Vented skylight designs have greatly improved over the years, and today, they are virtually leakproof. Additionally, if you live in an area of the country that receives intense sunlight, consider installing a shade with your skylight windows to protect your rooms during the brightest parts of the day. As always, the cost will vary based on your window's added features, such as specialized glass. A fixed skylight starts around $250. A manual vented skylight starts around $450. Unlike most other windows, which need to be cleaned often, skylights require little maintenance. Homeowners should refrain from constant cleaning, and instead, simply examine their skylight windows regularly for cracks and other damage or debris. Skylight windows often provide enough direct light that rooms with skylights will need little to no additional electric lighting. 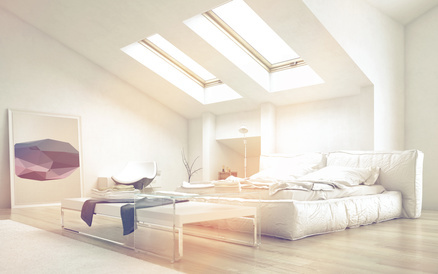 Additionally, vented skylights could be an excellent way to cool your rooms during the summer. These natural lighting and cooling properties can reduce your electricity bills. As with any surface made of glass, however, heat can escape through skylight windows, which can make energy bills more expensive. The U-factor for slylight windows is typically 0.50 to 0.40. Heat loss can be significantly reduced with the addition of a insulated glass such as low-e glass. Because they are usually located on the roof, skylight windows are a vulnerable area of your home and can be susceptible to leaks. It is therefore crucial that your skylight windows are installed properly. Homeowners should consider finding a general contractor, rather than a windows company, to install their skylights. General contractors can both frame the area and install the window itself. Check out HomeAdvancement's database of local contractors to get started installing your skylight windows.